Hannover. This year, parts2clean will be held at the Stuttgart exhibition center in southern Germany from 24 to 26 October. That may still be about four months away, but already the leading international trade fair for industrial parts and surface cleaning 2017 is looking set for one of the strongest performances in its 14-year history. That’s the picture emerging from the high level of exhibitor interest generated so far. Expectations are also riding high on “Cleanroom Analysis Processes”, a new special exhibition that profiles the entire cleanroom analysis process chain. 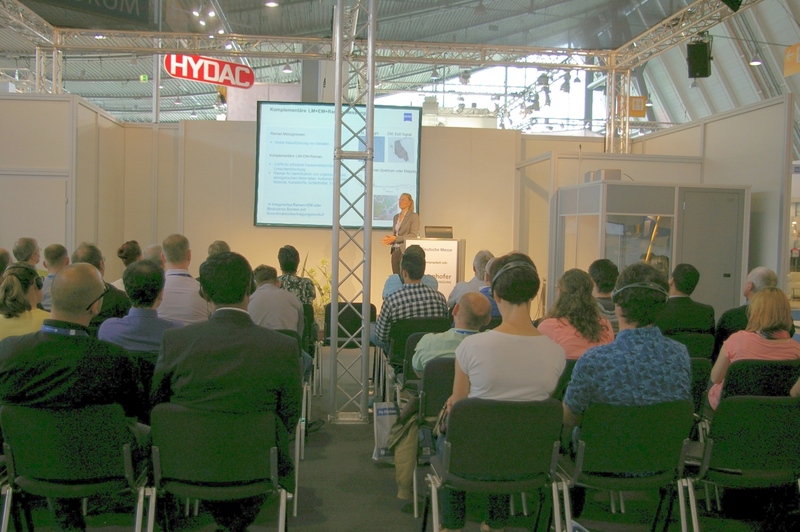 The winning formula also includes the ever-popular Expert Forum with its richly varied and informative lineup of simultaneously interpreted (German <> English) presentations on various parts cleaning topics. parts2clean 2017 has already notched up around 200 exhibitors with an exhibition space of some 6,800 square meters (over 73,000 sq. ft.). That’s way ahead of the booking rates recorded at this stage of the preparations for parts2clean 2015 and 2016. “We are pleased to report a good number of new exhibitors as well as numerous repeat exhibitors who have booked even larger exhibition spaces for parts2clean 2017,” commented Olaf Daebler, Global Director parts2clean at Deutsche Messe AG. Among the new features of the upcoming show is the “Cleanroom Analysis Processes” display, organized jointly by Germany’s Cleaning Excellence Center (CEC) and Deutsche Messe AG. The special exhibition is a group event at which eight manufacturers will band together to present all the components needed for a fully functional cleanliness laboratory. The components will be staged as an integrated process chain. Trade visitors will be able to get a quick overview of the equipment and facilities needed to achieve their required cleanliness targets and the technologies and processes used to test and verify conformity with those targets. They will of course also get to know the providers of the technologies and services on show. In terms of process flow, visitors will be able to look on as real machine parts progress through deburring and cleaning in the cleanroom before being transferred in a sealed clean-cart to the test lab cleanroom for cleanliness verification. The lab will be an ISO7 or possibly even ISO8 cleanroom facility in which the parts progress through flushing, filter drying, gravimetric analysis, microscopic analysis and documentation. The companies participating at the special exhibition are: Benseler, Dürr Ecoclean, Kögel, Nerling, Gläser, Binder, Sartorius, Jomesa and CleanControlling. Every morning and afternoon of the show, a team of technical cleanliness specialists will guide trade visitors through the entire process chain. The parts2clean Expert Forum is a regular feature of the parts2clean lineup. Staged over three days and headed by the Fraunhofer Cleaning Technology Alliance, the Expert Forum is an internationally respected source of expertise and knowledge on cleaning solutions for industrial parts and surfaces. “The parts2clean Expert Forum effectively functions as a seminar and training event that all visitors can attend at no additional cost,” explained Daebler. Its program is extensive, ranging from the basics to in-depth coverage of specific issues and challenges in multiple areas. It includes a series of lectures on Industry 4.0 in parts cleaning organized by the German Industrial Parts Cleaning Association (FiT). FiT is also organizing the parts2clean Innovations Forum – part of the Experts Forum that will feature new products and innovative solutions for chemicals and processes, plant engineering and equipment, measurement, testing and control systems, consulting, applications and services. The Expert Forum’s “Cleaning Processes” session comprises a series of lectures on processes and plant, fine and ultra-fine cleaning, as well as special processes and their applications. The Expert Forum also has a session on “Maintenance and operation of plant and process chains”. It features a series of talks on topics such as drying, workpiece carriers, corrosion protection, packaging and logistics, cleaning bath maintenance, and cleaning agent handling, conditioning and disposal. Other topics include quality assurance and quality control, quality-related process optimization. Information on issues relating to scheduled servicing after commissioning of cleaning machines, rights, duties and operator models will complete this session. The “Sectors/Applications” session explores various parts cleaning challenges and industry sector-specific solutions. The lectures in this session will deal with such topics as cleaning in the optics industry, cleaning of electronic components and cleaning in the automotive industry. The session also includes a series of lectures on cleaning solutions for plastics prior to downstream processes such as coating and gluing which surely will trigger lively debate. And last but not least, there is a session on “Analytics”. The lectures here will look at methods and processes for cleanliness analysis, products and solutions for technical cleanliness and ways of achieving maximum cleanliness by optimizing part designs and manufacturing processes. 2017 marks the 70th anniversary of Deutsche Messe AG, which was founded in 1947 with the staging of Germany’s first-ever Export Fair. Seven decades later, Deutsche Messe has taken its place among the world’s top organizers of investment goods trade fairs, sporting a rich portfolio of events held in Germany and around the globe. With 2016 revenue of 302 million euros, the company ranks among the five biggest trade show companies in Germany. Its portfolio includes such world-class events as (in alphabetical order) CEBIT (business festival for innovation and digitization), CeMAT (intralogistics and supply chain management), didacta (education), DOMOTEX (carpets and other floor coverings), HANNOVER MESSE (industrial technology), INTERSCHUTZ (fire prevention, disaster relief, rescue, safety and security), LABVOLUTION (lab technology) and LIGNA (woodworking, wood processing, forestry). The company also regularly hosts a number of internationally renowned events by third parties, among which are AGRITECHNICA (agricultural machinery) and EuroTier (animal production), both of which are staged by the German Agricultural Society (DLG), EMO Hannover (machine tools; staged by the German Machine Tool Builders’ Association, VDW), EuroBLECH (sheet metal working; staged by MackBrooks) and IAA Commercial Vehicles (transport, logistics and mobility; staged by the German Association of the Automotive Industry, VDA). With more than1,200 employees and a network of 58 sales partners, Deutsche Messe is present in about 100 countries. You are welcome to publish material from this press release, provided that you send us a courtesy copy or link to your publication.